This is a crop from a very badly shot pic that I was about to delete.. I wanted to do something with the very unique monument they have in the middle of a roundabout in a VERY crowded street.. I've seen puppet shows using this style of horse.. this one was HUGE in comparison.. they look so off from the rest of reality.. kind of sad.. In colour this thing is fab But the picture stinks.. I'm having a hard time getting the coloured version to look any good.. I'll try again soon.. Very cool image! I love the overexposed background, makes it look like a hand-sketched backdrop rather than a real city street. I'd love to see the horse in color! I LOVE this! 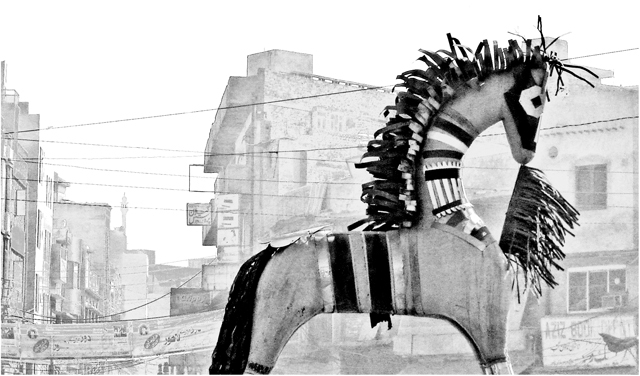 The horse is supposedly unreal in a real world, but in this the background looks pencil-sketched, leaving the horse as the real part in a made-up world. i like the composition, the overexposed background somehow works really well to highlight and isolate the horse. This is a very interesting picture. I wonder whether it could do with being a little smaller to try and raise the picture quality, and I would be very interested to see it with selective De-sat, keeping some colour on the horse. That said - I noticed this when you first loaded it and was struck by it then. For me the positioning and DOF help to make it. Certainly worth keeping. I actually really like this, I know it would probably be slated for the over exposure, but I think it works well here and it looks quite surreal. Love the crop, good rule of third shot ;-)>The graininess works quite well also. If there is one thing, with the sky appearing so overexposed, the edges of the buildings do look at bit 'wrong' IMO . I have so many shots that I used to delete also, but it's surprising what is in a shot if you look for a different angle, even if at first it appears rubbish !! Proudly hosted by Sargasso Networks. Current Server Time: 04/24/2019 01:49:43 AM EDT.